PKC alpha (69%) and beta 2 (62%) may cross-react in cells expressing high levels of these proteins. Synthetic phosphopeptide derived from a region of human PKC gamma that contains threonine 655. Hela cells treated with PMA, a phorbol ester. PKC gamma is an 80 kDa member of the conventional group (cPKCs: sensitive to calcium, diacylglycerol and phorbol esters) of the PKC family of serine/threonine family kinases that are involved in a wide range of physiological processes including mitogenesis, cell survival and transcriptional regulation. PKC gamma plays a key role in neuronal signal transduction and is translocated from the nucleus to the cytoplasm upon activation by phorbol ester, where in epithelial cells it has been implicated in regulating intracellular communication. The activation loop threonine (threonine 514 in PKC gamma) of conventional PKCs is phosphorylated by phosphoinositide-dependent kinase-1 (PDK1), which is necessary for their autophosphorylation, a critical step in the generation of a catalytically mature enzyme. Threonine 655 is an autophosphorylation site in the carboxy-terminus of PKC gamma. The antibody has been negatively preadsorbed using a non-phosphopeptide corresponding to the site of phosphorylation to remove antibody that is reactive with non-phosphorylated PKC gamma. The final product is generated by affinity chromatography using a PKC gamma-derived peptide that is phosphorylated at threonine 655. Our Abpromise guarantee covers the use of ab5796 in the following tested applications. WB Use a concentration of 0.5 - 1 µg/ml. Detects a band of approximately 80 kDa. Peptide Competition and Phosphatase treatment: Lysates prepared from HeLa cells stimulated with PMA were resolved by SDS-PAGE on a 10% polyacrylamide gel and transferred to PVDF. Membranes were either left untreated (1-11) or treated with lambda (ë) phosphatase (12), blocked with a 3% low-fat milk-TBST buffer overnight at 4°C, and incubated with 0.50 µg/mL ab5796 antibody for two hours at room temperature in a 3% BSA TBST buffer, following prior incubation with: no peptide (1, 11, 12), the non-phosphopeptide corresponding to the immunogen (2), a generic phosphothreonine containing peptide (3), the phosphopeptide immunogen (4), or, the phosphopeptide corresponding to the immunogen from other PKC isoforms (5-10). After washing, membranes were incubated with goat F(ab’)2 anti-rabbit IgG alkaline phosphatase and signals were detected using the Tropix WesternStarTM method. 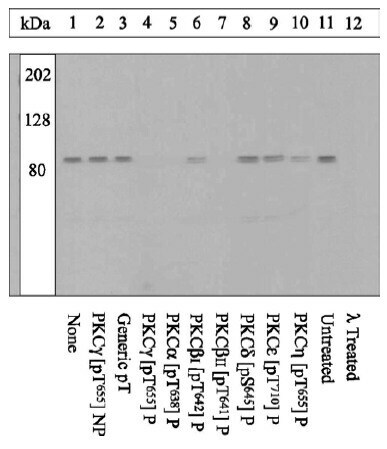 The data show that the peptide corresponding to PKC gamma [pT655] blocks the antibody signal while the peptides corresponding to PKC isoforms beta 1 [pT642], delta [pS645], epsilon [pT710] and eta [pT655] do not completely block the antibody signal, thereby demonstrating the specificity of the antibody. However, peptides corresponding to PKC isoforms alpha [pT638] and beta 2 [pT641] do block the antibody signal, indicating that the ab5796 antibody may cross-react with their respective sites. The data also show that phosphatase stripping eliminates the signal, verifying that the antibody is phosphospecific. Publishing research using ab5796? Please let us know so that we can cite the reference in this datasheet. There are currently no Customer reviews or Questions for ab5796.